A five bedroom detached residence situated in a sought after location and benefitting from: Gas central heating, UPVC double glazing, Three reception rooms, good size kitchen/breakfast room, two en-suites, double garage, garden office/gym and good sized rear garden. The accommodation comprises: Reception hall, cloakroom, sitting room, dining room, study, kitchen/breakfast room, utility room, master bedroom with en-suite shower room, guest bedroom with en-suite shower room, three further bedrooms, family bathroom, double width garage, garden office/gym and good sized rear garden. Energy Rating D.
Stairs rising to first floor, under stairs storage cupboard, central heating thermostat, wood flooring. White suite of pedestal wash hand basin, low level w/c, ceramic half tiling to walls, radiator, Upvc double glazed window to front aspect. Contemporary log effect hole in the wall gas fire, double radiator, radiator, television point, coving to ceiling, four wall light points, Upvc double glazed window to side aspect, Upvc double glazed French patio doors to rear garden. Two wall light points, coving, radiator, Upvc double glazed window to front aspect. Coving, radiator, Upvc double glazed window to front aspect. Fitted to comprise inset single drainer stainless steel sink unit with mono bloc mixer tap, cupboard under, further range of base and eye level units, edged work surfaces over, ceramic tiling to splash areas, extractor hood, integrated dishwasher, ceramic tiled flooring, double radiator, television point, inset down lighters, Upvc double glazed window to side aspect, Upvc double glazed French patio doors to rear garden. Inset single drainer stainless steel sink unit, cupboard under, further range of eye level units, rolled edge work surfaces, ceramic tiling to splash areas, plumbing for automatic washing machine, radiator, 'Potterton' gas fired boiler serving both domestic hot water and radiator central heating Upvc double glazed door to rear garden. Access to loft space, coving, airing cupboard housing hot water tank with linen shelving as fitted. Range of built in wardrobes, radiator, coving, television point, Upvc double glazed window to rear aspect. 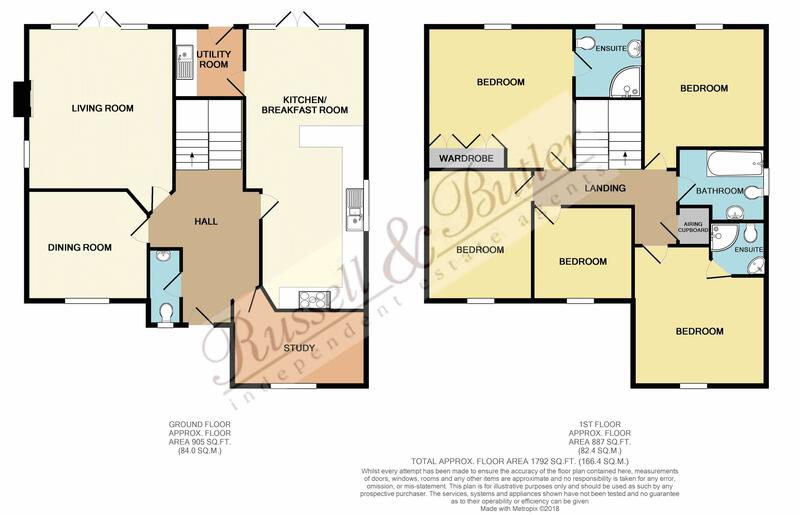 White suite of large walk in shower, wash hand basin with drawer, low level w/c, full height ceramic tiling to walls, extractor fan, ceramic tiled flooring, ladder towel rail, inset down lighters, Upvc double glazed window to rear aspect. Television point, coving, radiator, Upvc double glazed window to front aspect. White suite of fully tiled shower cubicle, wash hand basin, low level w/c, ceramic tiled flooring, ladder towel radiator, inset down lighters, Upvc double glazed window to side aspect. Television point, coving radiator, Upvc double glazed window to rear aspect. Television point, radiator, coving, telephone point, Upvc double glazed window to front aspect. White suite of 'P' shaped bath with shower over and glazed screen, wash hand basin with drawer under, low level w/c, full ceramic tiling to all walls and floor, extractor fan, inset down lighters, ladder towel rail, Upvc double glazed window to side aspect. Laid to lawn, hedge border, double width tarmac drive leading to double width detached garage, pathway to entrance, gated side access to side garden. Double width garage with electric roller door, power and lighting, eaves storage space, personal door to rear. Laid to lawn, paved patio, enclosed by hedge and shrubs. Brick built with vaulted ceiling, wood flooring, two Upvc double glazed windows, Upvc double glazed door to side.